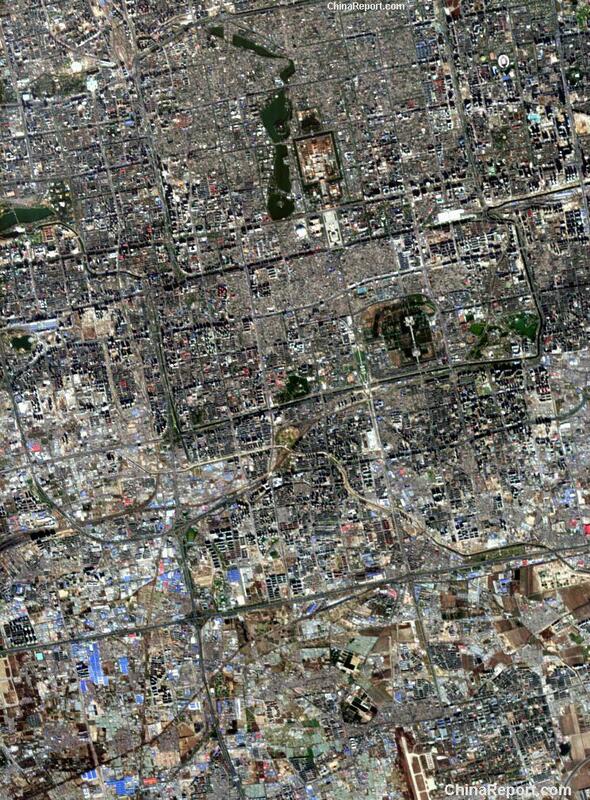 This Satellite Image dated 26 November 2004 , gives a clear overview of Central Beijing City, with clockwise the Xicheng, Dongcheng,Chongwen and Xuanwu Districts within the area of the Former City Walls (now 2nd Ring Road). Outside the Box-like Shape in the Photo, large area's of the outlaying districts of Haidian (North-West, includes Beijing Zoo), ChaoYang (East) and the large Fengtai (South) District can be viewed. In the extreme south-west lies WanPing Village and beyond the City Province, so far including mainly farmlands and industrial buildings. The City, however is fast expanding and surely new developments will have taken place, especially outside the City. The City is rapidly undergoing transformation, not only in advance of the 2008 Olympics, but further as a part of the city modernization plan to be completed in 2010 AD. Already clearly visible in the Xicheng District just West of the Great Hall of the Peoples, is the National Theatre Dome. Other Olympic constructions such as the Olympic Stadia and Olympic Village all lie Due North of this image, beyond Beijing- and Xinhua- Universities in the Haidian District. Included in this Map, links to well-known and easily recognizable landmarks in each district of the City, for easy reference, identifying and finding locations. Designates outer perimeter of the Inner Imperial City, an expanded Palace Area during the Ching Dynasty. Century Ming Dynasty Palace and Ching Dynasty expansions, comprising the Purple Imperial "Forbidden" City, most exclusive part of Beijing.